For 18 students, the great outdoors was their classroom as part of a field study course. Hunting, fishing, harvesting wild rice, and building your own shelter – DEVS 480 is a course unlike any other. These activities aren’t just worth marks, they are also what you need to do to keep your belly full and maintain a roof over your head. The course, which has the full name “Re-Indigenizing People and Environments”, is taught by professors Robert Lovelace and Richard Day from the Department of Global Development Studies, and is supported by many community volunteers. This field study begins with seven weeks of online study, readings, and discussion before taking students out on the land. Participants then travel to Eel Lake north of Kingston for the field portion of the course. For the following eight days, students live off of the land in an Indigenous lifestyle, they participate in Indigenous cultural practices like sweat lodges, and complete an in-depth study of Indigenous theory. “To secure good air, water, food, and relationships, human beings need a close relationship with the earth. Recognizing that we are dependent on the material earth but also upon the symbiotic processes – the interrelated actions – of earth is a beginning,” says Mr. Lovelace. 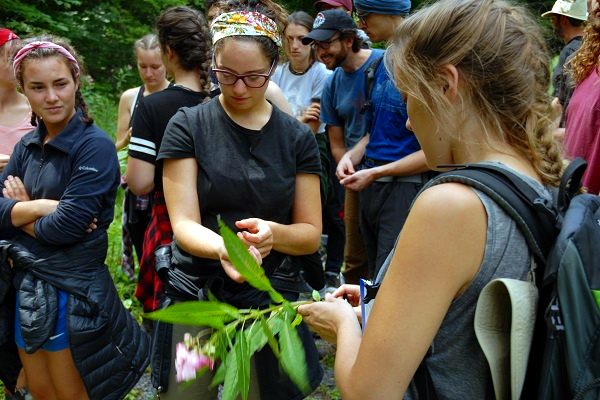 In addition to foraging for food and building a shelter, the students also hunted with a bow and arrow, learned about medicinal plants, and participated in workshops on tool making, managing soil, and growing food, harvesting, and preserving food. Jessica Franko (Artsci’19) enrolled in the course seeking something “tangible” and “unique” in her university experience. The course was full of those moments, but what stood out the most for her was harvesting wild rice. Ms. Franko is quick to point out, however, the challenges are not just physical – they are also mental and emotional. Max Lindley Peart (Sc’19, Artsci’19) similarly found the mix of theoretical and practical knowledge useful and challenging. After hearing about the course from upper year students, he had been hoping to enroll – and it didn’t disappoint. DEVS 480 is only offered every second year. The course is open to all students but mainly attracts students from the Faculty of Arts and Science, and a mix of Indigenous and non-Indigenous learners. To learn more about Global Development Studies course offerings, visit the Department’s website.